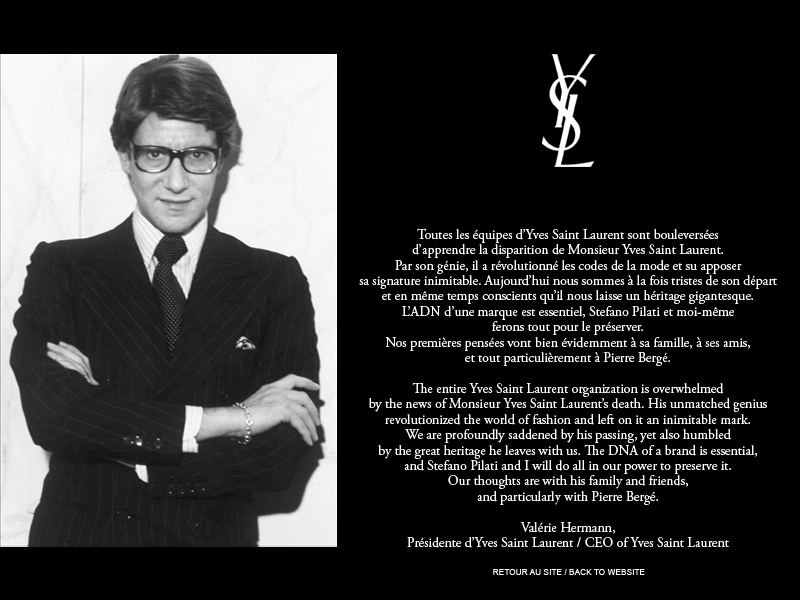 For most this is probably old news however if you are unaware Yves Saint Laurent passed away June 1 2008 at the age of 71. Saint Laurent was widely considered the last of a generation of fashion designers that included Christian Dior and Coco Chanel and made Paris the fashion capital of the world. I posted 3 videos one from his Haute couture show in 1962, a Fall/Winter 2008 YSL show and an arty manifesto from S/S08. A worth while exhibit is being displayed at the Montreal Museum of Fine Art. For the first time in 25 years, a museum is putting on a major retrospective of Yves Saint-Laurent’s work. And while Love, opening today at the Montreal Museum of Fine Arts, decidedly favors womenswear (and deservedly so), there are still a few things for the gents—early sketches and drawings of his dabbling in menswear, not to mention photos of the dapper man himself. (Sadly, there’s nothing from the Ford or Pilati eras.) The show is timed to the 40th anniversary of YSL’s founding, and will head to San Francisco’s de Young Museum later this year. Love: Yves Saint Laurent, today through Sept. 28, Montreal Museum of Fine Arts, 1380 Sherbrooke St. W., (514) 285-2000.